The link-arm mechanism allows the LA-Series actuator to provide characterized closure which slows valve travel and increases torque as the disc comes into the seat. The actuators feature high compressive strength yoke nut bearings which ensure reliable operation and increase cycle life. 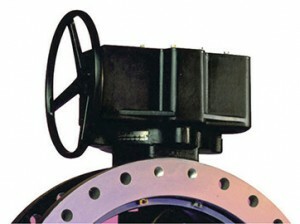 It is also self-locking, maintaining valve position under varying flow conditions. LA-Series actuators are sized to operate with a maximum input of 450 foot pounds on 2″ (50mm) square operating nuts, and an 80 pound rim pull on handwheels and chainwheels. The pointer on weatherproof actuators clearly indicates the valve position marked on the top of the housing. The indicator shaft is sealed to keep moisture from entering the actuator housing. Open and closed position stops are easily adjustable by simply repositioning the stop nut on the input shaft. Cast-iron housing in buriable or weatherproof construction. One-piece yoke machined from a ductile iron casting. Carbon Steel input shaft and aluminum bronze yoke bearing. Buried service actuators are grease filled per AWWA C504. Capability of 450 foot pounds against the open and closed position stops as standard. Hand wheel, chain wheel or 2″ (50mm) square nut options.